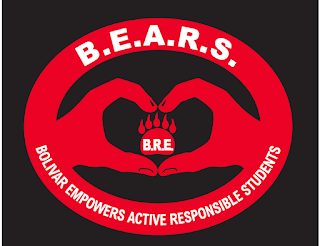 We Know...We Do...We Feel...We are the Bolivar B.E.A.R.S. Do you know a Bolivar student or community member that has gone above and beyond to demonstrate COURAGE? If you do then please write a letter about that student or community member. In the letter explain specifically how the student or community member has been courageous. Letters need to be turned in by Wednesday, April 10. The letters should be put in the Character Education box that is in the office. Families, if you write a letter just send it to school in an envelope with Character Education written on it.